“This is our Super Bowl,” said Erin Spano of Lindenhurst, who has been coming to the Belmont Stakes with family since she was 7. Women in fancy hats and men in pastel colors stood out among the tens of thousands who converged on Belmont Park to watch a chestnut colt make its run for glory Saturday. And Justify didn’t let them down — winning the Triple Crown, thoroughbred racing’s ultimate achievement. Pure pandemonium broke out as the estimated 90,000 attendees watched him cross the finish line. It was the first time Debbie Morgan and her husband Cliff of Dix Hills had been to Belmont Park. “If we’re going to go to our first horse race, it’s got to be this one,” Debbie, 54, said they decided. Cliff, 48, knew Justify would win, but Debbie wasn’t so sure. Still they bet $50 on him, and luck was in their favor. “That was awesome,” Cliff said, smiling ear to ear after the race. Debbie was glad she was wrong. “It’s really amazing to witness history in our own backyard,” she said. Mackenzie O’Brien of Huntington Station watched Justify’s historic dash alongside his grandfather Robert Bickmeyer. Bickmeyer, 80, used to attend the race with O’Brien’s father. But he died a few years ago, so this year O’Brien, 23, stepped in. The race did not disappoint. “It was awesome to see,” O’Brien said breathlessly after Justify swept past the finish line. 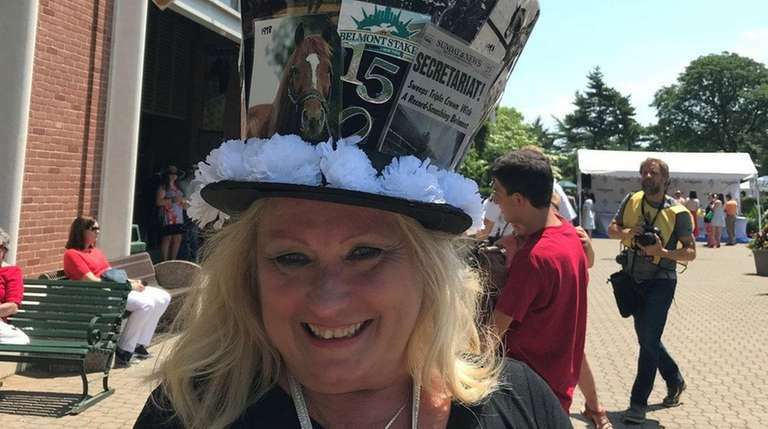 Erin Spano, 50, of Lindenhurst, who has been coming to the race with family since she was 7, sported a tall hat celebrating the 150th anniversary of the Belmont Stakes. The hat, adorned with photos of past race winners and topped with a tinfoil trophy, was crafted by her mother-in-law. Jane Jubilee of Maplewood, New Jersey, is a NASCAR fan, but her best friend, Doreen Cruz of Saylorsburg, Pennsylvania, loves horse racing, so she agreed to join her at the Belmont Stakes. “I’m taking a break from the cars to learn the ponies,” Jubilee said. Jubilee took care in designing her hat for the event, looking up the race’s history. She said she learned that the Belmont’s flower is the white carnation, so she incorporated it into her design. The two had been planning the trip for a year and were ecstatic to learn that the race could be a Triple Crown, Cruz said. “It’s a bonus,” she said. Cruz has been watching horse racing with her family for many years. For Harry Gopaul, 73, Saturday was his third trip to the Belmont Stakes. Gopaul, who came all the way from Corpus Christi, Texas, saw Justify win the Kentucky Derby, the first leg of the Triple Crown. Kyle Cummings, 52, and David Deneen, 55, both of Cos Cob, Connecticut, spent four hours on the train getting to Belmont due to the large crowd. Cummings bet on Justify for herself and Gronkowski, another contender, for her son. Placing first and second respectively, her $20 became $445. “We’re getting dinner in Manhattan,” Deneen said smiling. Troy Wilson, 32, drove from his home in Grand Rapids, Michigan, to see Justify. Getting in the spirit of the event, Brooklyn resident Kate Wilkoff, 27, and her friends had a hat competition. Wilkoff donned a white wide-brimmed straw hat decked out in different-colored flowers and even some fake grapes, because they “really made me laugh,” she said. “I thought they’d be a great addition for a wine-drinking theme,” Wilkoff said. Wilkoff was at the Belmont for a good time, not to bet on horses. “I’m not educated enough in the arena to be betting,” she said. Cara Keisling, 46, and her mom, Patti Keisling, 73, flew in from Riverside, California, overnight for the race. Cara said she likes the “pomp and circumstance,” as well as the history and the horses. When Justify won the Preakness Stakes, which fell on the same day as Cara’s birthday and Prince Harry’s wedding to Meghan Markle, she knew she had to go. “When are you going to get another opportunity to see history?” she said. A third-grade teacher, Cara said she’s familiar with probability, so she steers clear of bets like the trifecta. “You have to have a crystal ball,” she said. After watching Debbie Moore pick winners in the first two races of the day, Julie Polito naturally sought her friend’s advice in betting the third. “Pick one,” said Polito, 64, showing Moore a program listing the horses in the race. The pair stood in front of a betting window. “The names aren’t jumping off the page,” the 60-year-old from Inwood said. “She just seems to be on a streak, but you can see she’s not cooperating,” said Polito, of Palm Beach, Florida. In any case, Polito knew what her friend would do with her $11.90 in winnings. “She’s going to buy me a drink,” Polito said. Neither woman was dressed extravagantly for the race. “This is not the royal wedding,” Moore said. Belmont Stakes winnersResults from every year of Triple Crown's final leg. Justify goes for history in the Belmont StakesThe chestnut colt will try to join Seattle Slew as the only undefeated horses to sweep the Triple Crown races. At Belmont, group protests cruelty to horsesTheir voices rang out loudly, as women in tall fascinators, and men in seersucker suits ... 50 Belmont Stakes questions for fans, neighsayersIn honor of the 150th running of the Belmont Stakes, here's a complete guide to race day logistics, the history of the event and more.